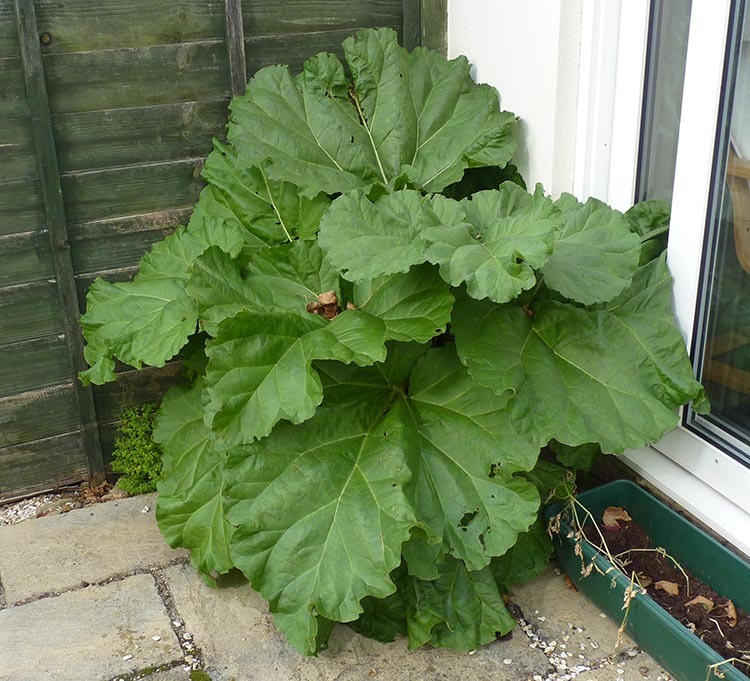 When my son and fiancée moved to their new home in the UK they inherited a neglected, but nevertheless healthy rhubarb plant which had masses of thick juicy stalks. I was green with envy as the plant was growing in a small container and I’d desperately tried for years to grow rhubarb in containers, with little success. 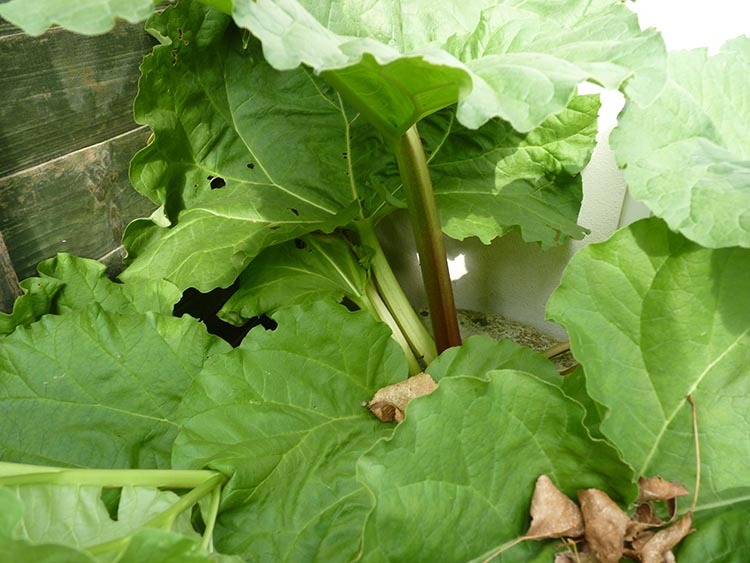 Thinking of my ailing rhubarb plant in Portugal I jealously stared at it in disbelief; it defied EVERYTHING I’d been advised about growing rhubarb in containers – the container was too small, the soil was of poor quality and dry as a bone! Why did this neglected plant look so healthy and my loved and nurtured plant, so sickly? Healthy thick stalks of rhubarb! Six months later, while celebrating our grandson’s first birthday, I reminded our son he’d promised to cook me a rhubarb crumble. 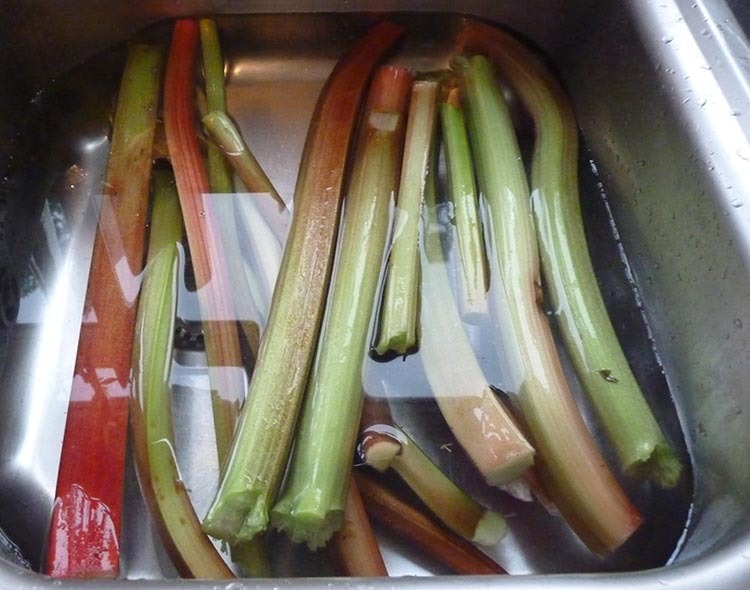 True to his word he duly picked a bowl full of thick healthy rhubarb stalks and I left him in the kitchen to prepare the desert. I asked him to take some photos once cooked, so I could share the recipe of his delicious creation on my blog. However, when I later questioned him in detail about the recipe he began to squirm, prevaricate and then admitted he’d cheated by using a prepacked crumble mix. All the time we were eating he must have dreaded the moment of truth. He’d been telling his Mum *porkies. *(Porkies is a version of cockney rhyming slang: Pork pies which rhymes with lies). I have no formal recipe. I just put a handful of oatmeal, a little whole-wheat flour, brown sugar, and some butter into a bowl, smoosh it together with my fingers, and crumble it over fruit…hope that helps! 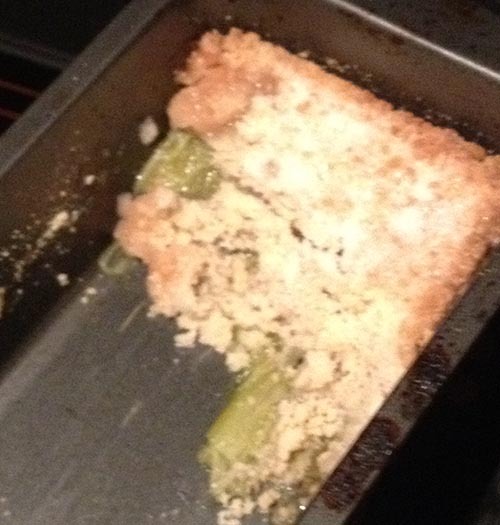 Cook the crumble separately, in a hot oven. This gives it a real crunchy texture instead of it being a soggy mush. Rub 2 ozs butter into 3 ozs plain flour in a mixing bowl until “they resemble breadcrumbs”. Then add 1 ½ ozs of brown sugar. Finely chop a handful of nuts and add them to the mixing bowl, with a pinch of cinnamon, stir together. Sprinkle onto a baking sheet – spreading it out and cook it in the oven for about 10 minutes. Turn the mixture & return the tray to the oven for another five to 10 minutes, just until the mixture is golden but not burnt – and it’s incredibly crunchy. Assemble the dish about 5 minutes before you serve it up. Put the fruit filling in a microwave safe baking dish, sprinkle the crumble mixture on top and reheat it in the microwave for about one or two minutes, depending on how hot you like it. I prefer warm rather than piping hot, so it’s just a quick 60 seconds. To Serve: Vanilla ice cream, whipped cream or thick natural yoghurt. Great recipe, grannymar. Thank you! I will make sure he tries it! That plant looks hearty and hale. Wonder what the secret is? 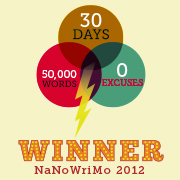 I wish I knew…I’m surprised after 6months it’s still alive! Looked good regardless of the cheating 🙂 I have found the secret with my rhubarb is lots of manure and tons of water, I am still picking mine when everyone else’s are long since done 🙂 oh and full sun!! I also have mine in the garden not in a pot!! Yeah, but his rhubarb gets nada! Hi Chica, I love crumble…and asking for recipes I’ve discovered some different variations! Never made rhubarb crumble, just a rhubarb sauce to put on toast or over cake or ice-cream. I should look for a plant to grow in my garden as I love rhubarb. Hope your son learns how to make a great crumble so he doesn´t have to cheat next time Carole! Oh my, that reminds me – Shortly after I bought my rhubarb plant I made my mother a rhubarb crumble from ‘the first harvest’ as promised. In fact the rhubarb was from the supermarket. I too had trouble growing rhubarb in a pot. After 4 years, when the plant was, in my view, no longer in the land of living, I handed it over to my sisiter who planted it in her garden. Within weeks it was flourishing and now needs cutting back to keep it under control. I keep promising myself to find a spot in our garden for the rhubarb, but looking at my sons thriving rhubarb I still live in hope. Next spring I’m going to get another plant and plant it in my old compost heap! I tried to grow rhubarb in a large ‘bucket’ in Portugal, no luck whatsoever! I love rhubarb and it’s one of the food items I have had to forego in all my years of being overseas :(. Can’t find it anywhere and being from West Yorkshire that’s a crime! I used to make a lovely crumble when I lived in cooler climes, now I have to admit I use a crumble mix (which I have to bring from the UK when I return!) as I can’t keep the butter cold enough to rub into the flour here in the tropics! Any rhubarb gifts gratefully accepted …. Hi Lizzie, maybe it’s too hot in the Algarve. I do not recommend growing rhubarb in a pot, or any other type of planter. Although some sources claim it is possible to do so, it is not recommended. Rhubarb will thrive when planted in your garden, but not in a pot. The desserts look delicious! Desserts – stressed backwards – love it! PruningAt the end of the growing season, the rhubarb will begin to wilt away and go brown. Cut back any remaining foliage and it will grow back the following spring in abundance again. HarvestingImportant: Only eat the stems of the plant i.e. the bit between the ground and the leaves. The actual leaves themselves are poisonous (they contain oxalic acid)!